The problem of invasive ants may be far worse than previously thought. A Spanish team of scientists has found that larger than expected numbers of the insects are being unwittingly shipped around the world. The researchers warn that many of these species are establishing colonies in their new habitats that could pose a threat to the environment, infrastructure and human health. The research is published in the journal Royal Society Biology Letters. Lead author Veronica Miravete, from the University of Gerona in Spain, said: "Due to their small size, most ants are transported involuntarily in containers and other boxes, together with soil, wood, ornamental plants and fruits etc, on ships or airplanes." Dr Miravete said: "The number of ants arriving is very large and 85% of the introduced species are able to establish successfully. This indicates that there are many introduced species that are living around us as of yet undetected." While not all animals that move to a new region pose a threat, some can wreak havoc - and invasive ants are some of the worst alien offenders. In Europe, aggressive Argentine ants have been building mega-colonies, and they are out-competing local ant populations, which has sent ripples through the ecosystem. And in the US, the invasion of South America's Rasberry crazy ants has caused a host of problems as the insects swarm inside electrical equipment. The spread of fire ants has also been unwelcome because of their painful sting. The researchers said that more needed to be done to halt the spread of these pests. 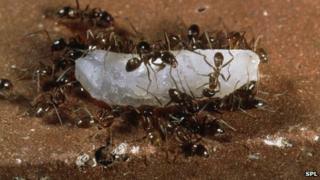 Dr Miravete said: "Once exotic ants establish a new region it is very difficult eradicate them. "There are different methods to prevent alien species, such as pre-border risk assessments, black lists and quarantine inspections. But especially, we have to observe shipping routes from the regions with the highest probability of leading to introductions." Royal Society Biology Letters: How many and which ant species are being accidentally moved around the world?